Thank you for your quick delivery. As it is pure, we use in peace. This review is about item#45316494. The ink lasts longer than the one we used before and the number of times to replace it has decreased. This review is about item#45316503. It is genuine so you can use it with confidence. I want to buy consumables cheaply even a little. This review is about item#45316521. The price of the ink itself is satisfactory, but I personally feel that I am well equipped. This review is about item#45316476. I use it with confidence because it is a genuine product. Is this a review or something? This review is about item#45316485. I wish to buy one, although price is stable and safe, expiration date is safe for more than 1 year, desire It becomes a high price at a mailing cost and refrains from purchasing. This review is about item#45316512. Although I was using recycled products and general-purpose goods for a while, I returned it to this. No matter what we say, we can trust with manufacturer genuine. 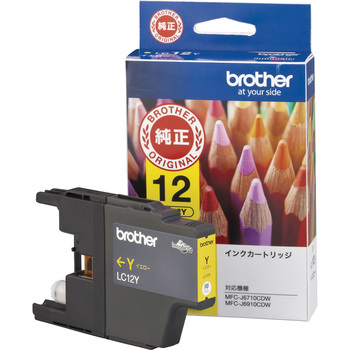 Since I am using a Brother printer, I use a genuine ink cartridge brother LC 12 for printing of photo books etc, I can do good printing. I am concerned that ink will be consumed quickly.